The last couple months have been really rough for me. It has obviously caused me to slack on postings and I apologize but I kind of went off the deep end with shopping and life. I had my October episode with Forever 21 and just this month did it again at American Apparel. I also bought little (new) things here and there in November so I can't say I ended the year strongly. I did really well for 10 months though, right?! Thank you to everyone that gave me a hug, a kind word or encouragement. It was very much appreciated. In other news, I got a new apartment...and you know what that means? Time to decorate. So the heartache isn't as bad because I've been able to focus on moving, painting, decorating and shopping for household goods. It's been a really good distraction. I love my new place and it worked out so perfectly. I had looked at a number of apartments back in June when I got my promotion but I decided to move in with Buster. But when I was looking, every place I saw was horrible-small, in bad neighborhoods, no character, 70's or 80's interiors...yuck. This time around, the first apartment I toured was the one. I didn't need to look any further! I have a very specific list when it comes to where I live: old, lots of character and old! Sounds crazy when most people are hoping for granite counter tops, parking and dishwashers. The first thing I go for is original hardwood floors, a classic kitchen and good bathroom tiles. I got all of these, plus tons of light, plenty of storage, an intercom system for security and 10' ceilings!!! All I can say is God's timing is perfect. So far I've gotten the kitchen, bedroom and bathroom in order. I need to work on the living room next. And by work on, I mean find a couch! I got rid of my beautiful, micro suede, red, fluffy couch while moving because I didn't want the same color palette as before. It was time for big changes and decided to make this place much more feminine with pinks, golds, baby blues and floral prints. So that meant no red couch. As of right now, my living room consists of a desk, chair and Christmas tree (duh)! I'm on the hunt for the perfect vintage, floral, 60's or 70's sofa. If I can find one with a sofa bed, I would die. Below are some pictures of what I've finished so far. Oh and everything I've bought for my home is used-it's only new clothes I've been after. I used Etsy and Craigslist a lot and found a ton of necessities at Goodwill and Salvation Army stores. I did run to Target for things like a broom, mop, cleaning supplies, nails, etc but my place is mostly used which I'm thrilled about. Oh and I bought paint, primer and brushes from Home Depot...you'll see what I painted in the pictures below. This is my favorite place. 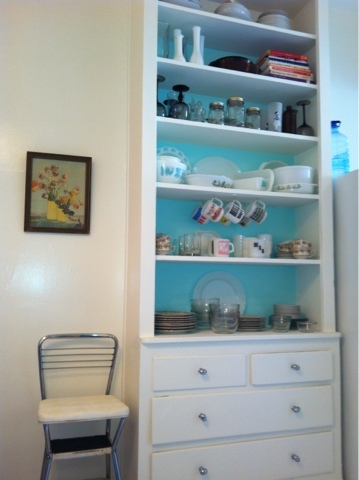 I always wanted a kitchen with open cabinets to show off my milk glass collection. I painted the shelves myself...just don't look at the top shelf, I wasn't tall enough to reach that one. I am kind of obsessed. I heard someone refer to it as Pyrexia, very funny. I added the hooks for all of my mugs, but need to add more. 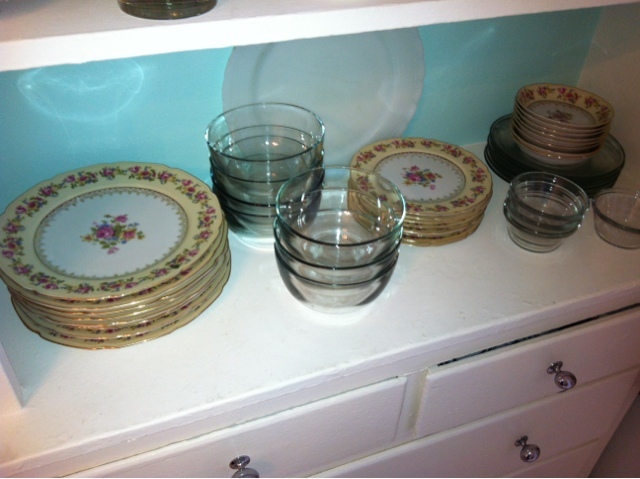 My aunt Carolyn gave me boxes of china that belonged to my great grandmother. It is SO special and such a great addition. Another favorite, I spend a lot of my time at this breakfast bench. 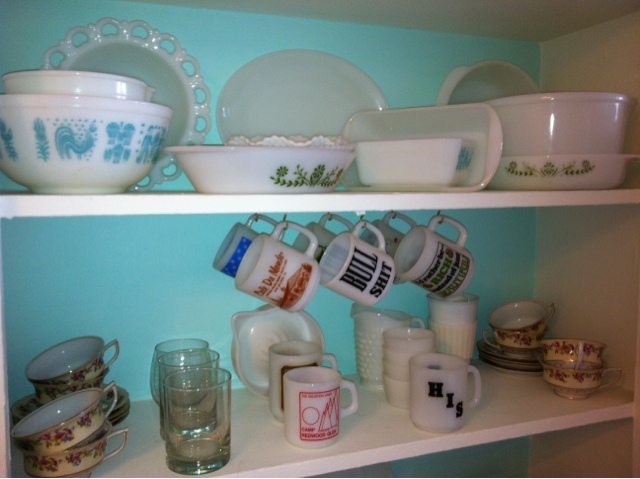 More milk glass on display. 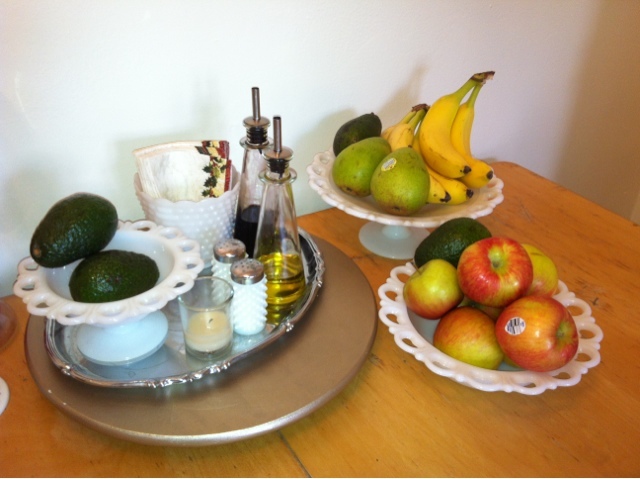 Don't forget to eat your fruits and vegetables! 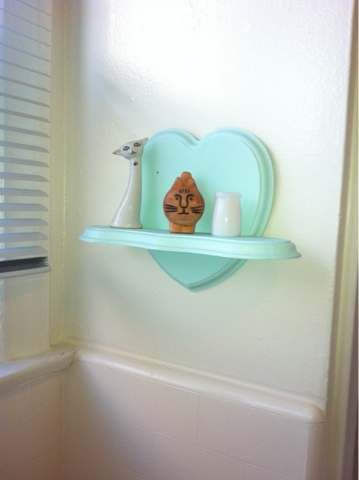 I got this silly thing at Goodwill and painted it the same color as the shelves. 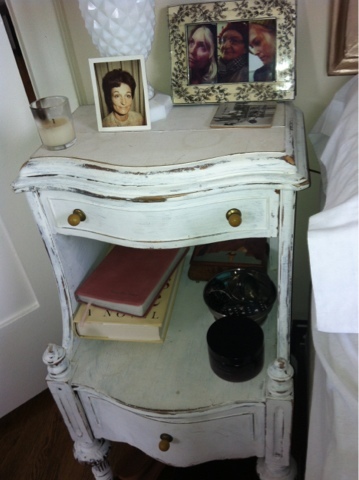 This nightstand was a Craigslist find. Negotiated down $10 but still overpaid. I didn't care though because it was just what I was looking for. Notice the milk glass lamp, also my great grandmothers. I think that is where the obsession started!!! 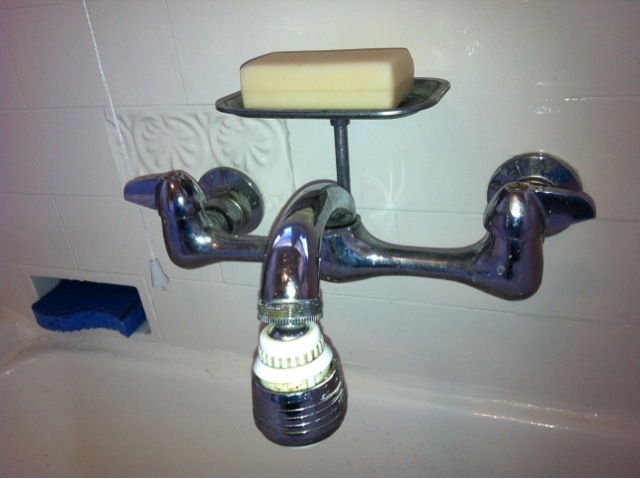 Another DIY project. 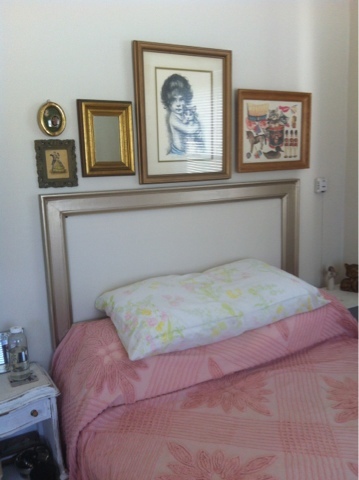 Buster let me have that frame (he used it to case a guitar) so I painted it and hung it on the wall as a headboard. I am trying to decide if I want to put something inside of the frame or leave it as is. All of my sheets and comforter are used. I took some pillow cases from my mom ;) and the rest were finds. The chenille comforter was from Etsy and I LOVE it so much. Feminine and delicate. 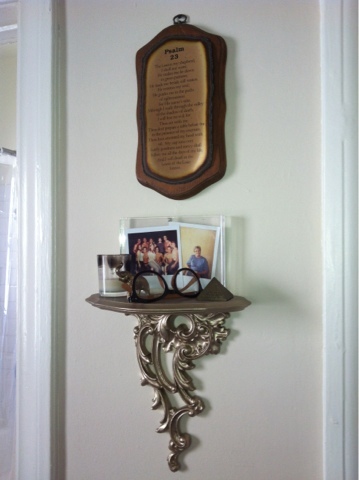 Dinda's Psalms 23 and a shelf from Goodwill. It was white so I painted it the same color as the headboard. 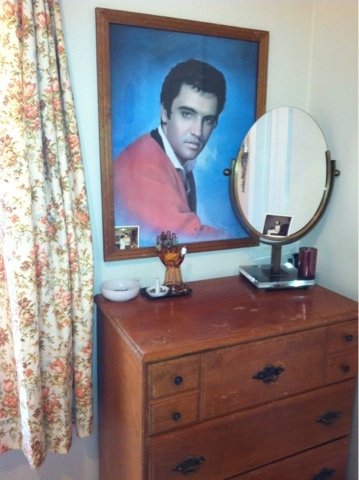 Of course I have Elvis in my room, Etsy curtains, and more milk glass. This guy is great, and almost new. 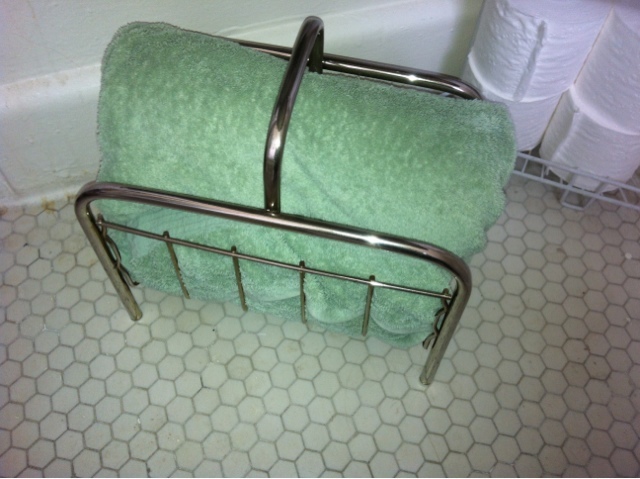 I am convinced the first owner had too much trouble trying to put the thing together and gave up. It was a pain. 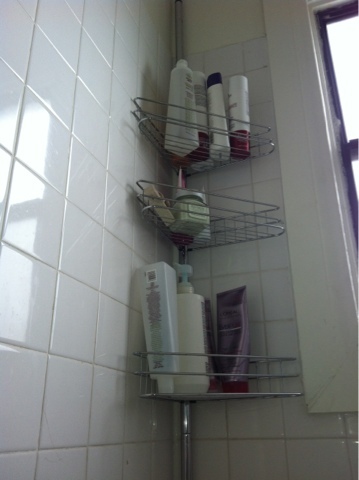 My favorite bathroom rack. It came with me from Long Beach. 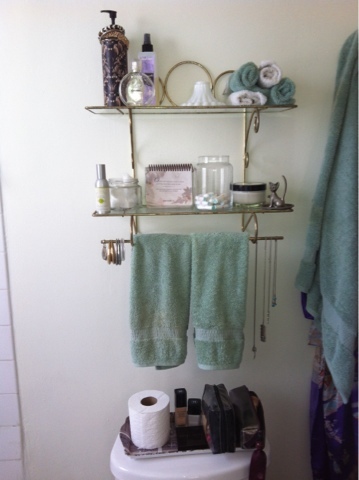 Towel rack from Etsy, and hexagon tile that I love. The building was built in the 20's and I am pretty sure the tiles are original. 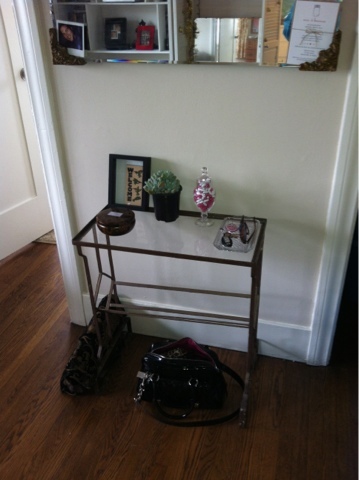 I got this table from the Long Beach Flea Market with my sis in law Arin. I cannot believe I never went there the whole time I lived in LB. Such a shame. 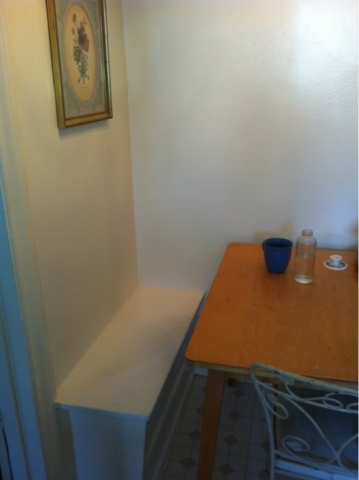 This alcove used to hold a Murphy bed but has since been replaced with shelves. I still need to do a lot of work in here. I am looking for a TV, and need to hang more pictures. 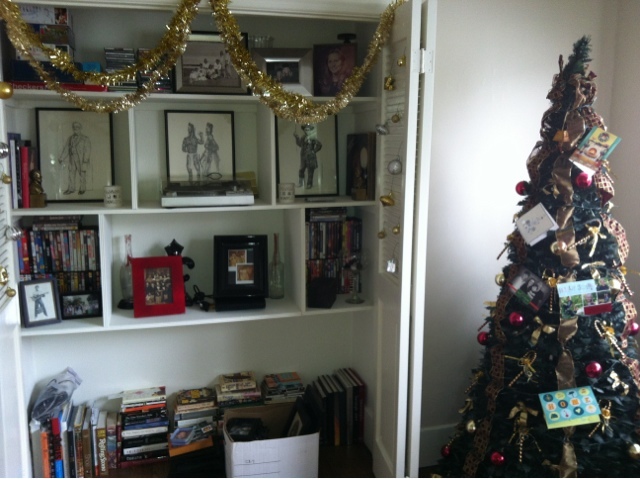 But I have the holiday essentials: tacky garland, ornaments and a fake tree from my parents! I always thought I read all your posts, guess I missed this one - duh!